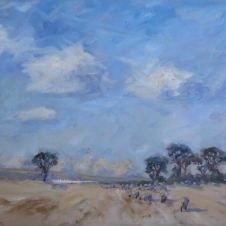 Christine Pybus is an artist, working in both oils and watercolours, with a particular love of painting plein-air seascapes, landscapes and snow scenes. Exhibiting throughout Britain, she also gives demonstrations to art societies, tutors groups of painters, writes for art magazines and writes on art history. Whilst home is Whitby on the North Yorkshire coast, she travels extensively to work, including to New Zealand, Australia and throughout Europe. Details of where her work is currently on view are on this website, along with news of forthcoming exhibitions, do feel free to call should you want more details.